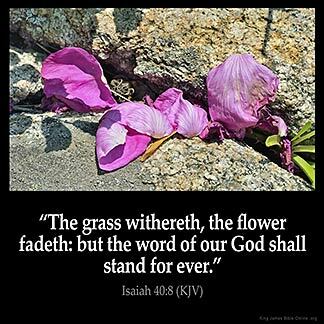 ISAIAH 40:8 KJV "The grass withereth, the flower fadeth: but the word of our God shall stand for ever." 5And the glory of the LORD shall be revealed, and all flesh shall see it together: for the mouth of the LORD hath spoken it. 6The voice said, Cry. And he said, What shall I cry? All flesh is grass, and all the goodliness thereof is as the flower of the field: 7The grass withereth, the flower fadeth: because the spirit of the LORD bloweth upon it: surely the people is grass. 8The grass withereth, the flower fadeth: but the word of our God shall stand for ever. 9O Zion, that bringest good tidings, get thee up into the high mountain; O Jerusalem, that bringest good tidings, lift up thy voice with strength; lift it up, be not afraid; say unto the cities of Judah, Behold your God! 10Behold, the Lord GOD will come with strong hand, and his arm shall rule for him: behold, his reward is with him, and his work before him. 11He shall feed his flock like a shepherd: he shall gather the lambs with his arm, and carry them in his bosom, and shall gently lead those that are with young. The grasse withereth, the flowre fadeth: but the word of our God shall stand for euer. The grass withereth, the flower fadeth; but the word of our God abideth for ever. The grass withereth, the flower fadeth: but the word of our God shall shall stand forever. Withered hath grass, faded the flower, But a word of our God riseth for ever. God 's promise to mankind, that His Word is eternal, just as He is. Everything in the universe is His creation He will give life as He pleases. Thank God that He provided life to all that receives His Son Jesus. Well said Eve Smit : The word of the Lord is forever settled in heaven . Man put things in the word of God that is not even from the Word of God : Everything that we say that the word of God says MUST be backed up by the Word of God. Other wise that word will fall to the ground and not produce Fruit !!!! We all see the grass withering and the flowers fading, what can't physically see is that for ever, God's Word is settled in Heaven. Psalm 119v89. People may try to alter the words and the meanings of the words but it won't alter it in Heaven. Jesus said the word that he had spoken shall judge us in the last day. John 12v48 so it is vital that we maintain the integrity of his word so that no man will be misled and we will be held to account for deliberately misleading others about the doctrines in the bible.